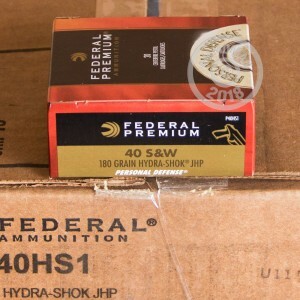 This .40 S&W ammo from Federal's Hydra-Shok series is a solid choice for concealed carry or home defense. This ammunition is named for the Hydra-Shok bullet it fires; the Hydra-Shok is a jacketed hollow point design with a distinctive center post and notched design that provides reliable expansion and penetration to stop an assailant quickly. Each cartridge in this volume priced case of 500 fires a 180 grain projectile at a muzzle velocity of 1,030 feet per second. 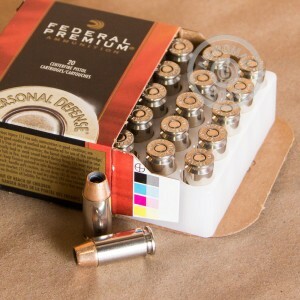 This ammo is loaded in Anoka, Minnesota using non-corrosive Boxer primers and nickel-plated brass cases. 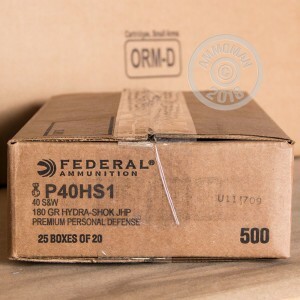 AmmoMan.com is a great place to pick up case-priced ammo like this. We offer free shipping on all orders over $99 so you can concentrate on picking the ammo that's right for you without worrying about shipping weights and zip codes.